Peek-a-boo Lou! How are you? What did you say? You want to play? Lou's a country girl, she comes from the mountains, loves fruit and flowers and is a sweet, good-natured soul. She isn't plain though, she likes to dress up with her blue popcorn necklace and has a twinkle in her eye. Yes, there's a little sparkle, perhaps a dream of travelling to distant lands? 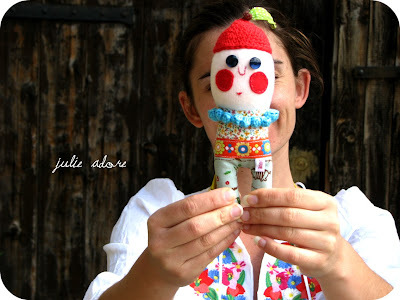 Paris-based Julie Adore is one of my favourite artists/crafters/makers (probably because she's Russian). She sews, knits, crochets and draws, all with the same enthusiasm and talent. 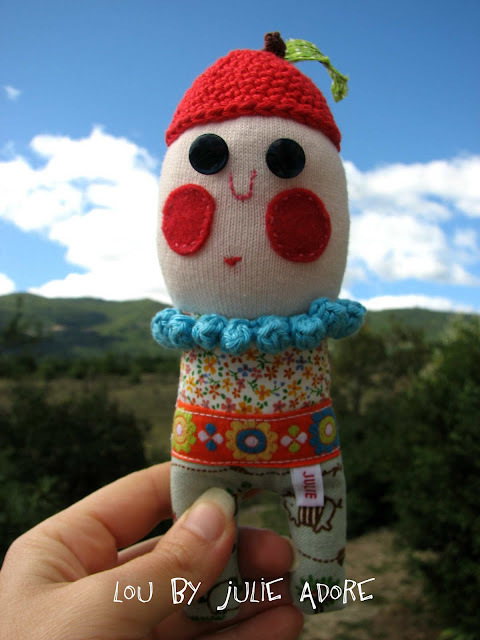 I have featured her quirky drawings before and today I am delighted to offer you the chance to win 'Lou', one of the original, endearing dolls that she hand-makes to order. Si vous voulez une chance de gagner Lou, une magnifique petite poupée créée sur-mesure par Julie Adore, laissez-moi une commentaire. Vous avez deux chances si vous relayez l'info par twitter, facebook, ou tout autre réseau. N'oubliez pas de me laisser un email. Le jeu s'arrête Le Mercredi 14 Septembre à 18 heures CET. ♥ Julie dolls, fingers crossed to win this doll for my daughter. thanks for this giveaway!! We have here a little boy who will love to recieve a new doll to play and make theatres while his sister dance around the house. Will share on Facebook in a minute. Lagardiva - 2nd chance sur Twitter! I'm in! I just love Julie's dolls and would be delighted to win this little Lou! Thank you so much! I'm crossing fingers! 2nd chance sur twitter ! Oh she's lovely! I'm in please! Waaa j'adore!!! Merci pour ce joli concours! No conocía a Julie... y adoré su trabajo y blog.... el muñeco es precioso y me encanta la idea del concurso, la expectativa del premio... Gracias!!! Paloma a besoin d un Doudou pour la crèche et elle n a encore craqué pour aucune de ses peluches!!! Alors si elle est comme moi et si on gagne cette poupette, elle adorera celle là et ne la quittera plus. Julie Adore is one of my favorite artist! She's always soo inspirational!! Fingers crossed to win this beauty! Jolie, vraiment très mimi! Je tente ma chance! et ma seconde chance est via hellocoton su ma page! J'aime beaucoup ce que fais Julie, c'est frais et si adorable. Don't know where you find such gems. Lou would be a great present for a special someone I know. I really love it... très personnelle originale, superbe ! Lou is the cutest thing I have seen in a long time. Am due a new baby in March and would love Lou to cheer up baby's room. Ohh, yes!! My little sister is pregnant... it would be a wonderful present for the baby girl that'll come! The info is on my facebook too !! Oh, I meant to enter this!!! If I didn't, I am now! It's a lovely doll! Forty chances in all = removed one of pre' reg art who was down three times instead of twice.